Did you know, video brochures can truly move your audience – target their hearts and minds and compel them to act or gain an emotional connect with your brand. 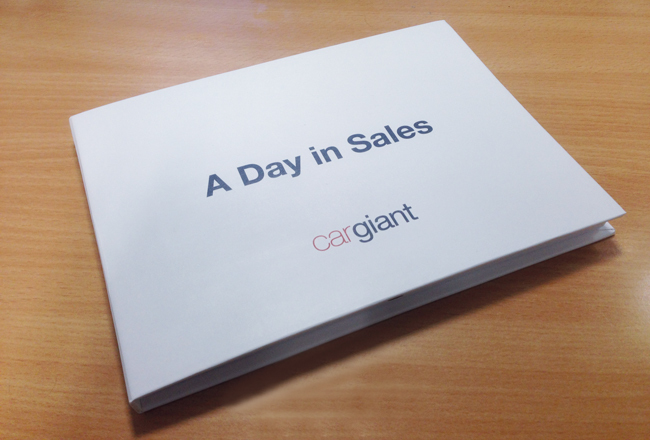 Here is a special preview of a new video brochure we have created for Cargiant and used as a direct mail piece for their customers. This follows on from the coffee table book we published earlier in the year – the new project ‘A Day in Sales’ adds another strand to the brand weave of this automotive giant. The film contained within the video brochure tells the story of a record breaking day at the world’s largest used car dealership. And compelling stuff it is. Complementing our inventory-based brand book very nicely too! Direct mail video brochures that deliver a self-playing movie to stakeholders in the form of of a mini brand book format is a sure way of grabbing their attention. If you remember your parlour game charades – it’s a book and a film, two words, first word first syllable, sounds like…. Cost effective business card size versions and a number of different formats of video brochures are available (some with text pages) and these can be branded with your campaign or corporate message. Attention grabbing, classy and slick. What better way ti get your targeted prospect to preview your message without the need to go online. In terms of the content we can devise the campaign, storyboard and create your movie, either from scratch or alternatively using an edited together combination of existing footage joined up with new sequences. An effective movie can be made to suit all budgets. The message really is the medium. A short and focused pitch is the best way forward. You may start with the message you deliver in your static advertising and add a new level of dynamism, or you may come at this from a ‘moving’ perspective and use the animation to demonstrate change, a process, an action or a story. For more information about video brochures and how they can best work for you, please speak to Frank Norman on 01784 410380 or contact him by email.